"PerfectSquare™ Technology": Pulse is electronically controlled on both the leading and trailing edges to maximize transducer performance and near surface resolution. PRF adjustable from 10 Hz to 1 kHz in 10 Hz increments. All measurements are taken "single shot". The EPOCH XT incorporates many standard measurement features including a tunable square wave pulser, selectable narrow-band and broad-band digital filters, gain range from 0 to 110 dB, peak memory and peak hold, adjustable PRF, 0.001 in. (0.01 mm) measurement resolution, and two gates with programmable alarms. In addition, the unit offers many standard and optional application-specific software features: Dynamic DAC/TVG (Distance Amplitude Correction/ Time Varied Gain), On-board DGS/AVG, AWS D1.1 & D1.5, Curved Surface Correction, and GageView Pro. Standard digital receiver filtering-broadband, several narrow band settings, and a high-pass setting. Direct access to important instrument set-up parameters. The EPOCH XT offers three battery options that provide long-lasting battery operating time depending on display brightness and battery selection. 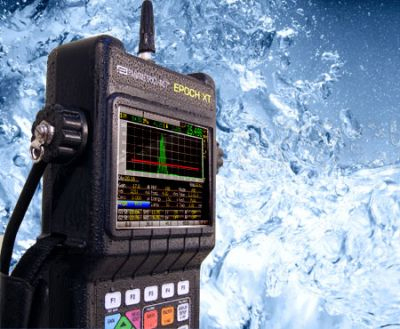 The rugged EPOCH XT is designed to meet the requirements of IP67. The instrument can withstand the rigors of field operation in harsh environments from offshore to deserts. The optional GageView Pro Interface Program helps manage and format stored inspection data. Data can be printed or easily copied and pasted into word processing files and spreadsheets for further reporting needs. The GageView Pro Interface Program also allows the creation of a customized database of identifier (ID) strings that can be uploaded to the EPOCH XT. New features include remote display of live EPOCH XT screen on a PC, live screen capture mode, database backup/restore, and multi-view windows. The Interface Program is fully compatible with the EPOCH 4, 4B, 4PLUS, LT, and XT. The EPOCH XT's sophisticated datalogger is designed for ease of use while providing a wide range of features for many flaw detection and thickness gaging applications. Employing both EPOCH 4 series and the Panametrics corrosion thickness gage technologies, the EPOCH XT is ready to meet your inspection and thickness measurement survey requirements. The EPOCH XT also offers onboard report generation. Operators may set up custom report headers and print directly from the instrument using the USB Host Port. ** The EPOCH XT has been designed to meet the requirements of IP67 to ensure that it is suitable for use in harsh environments. The customer replaceable instrument gaskets for the battery door and I/O access door must be properly maintained to ensure the effective sealing over the life of the product. Olympus does not recommend that an EPOCH XT be submerged for any reason as it is not intended underwater use. Instruments that exhibit damage due to submersion will not be covered under the instrument's limited warranty.